From photography’s earliest days, a small number of photographers and editors have misled the public. Others have made mistakes of judgment and execution. Regimes have used altered images as propaganda. This exhibition examines prominent cases and ethical documentary practice. Documentary photographs and photojournalism must be accurate representations of the scene before the photographer’s camera--without alteration. If the public is to have faith in the integrity of the image before them, and by extension the media, images must be taken and published in a forthright manner. Broadly speaking, the photographic alterations in this exhibition fall into three categories. STAGING: Photographers must not direct a subject or use the photographer’s presence to significantly alter an event. History unfolds in real time, not at the desire of the photographer. Portraits are the exception to this rule and should be clearly identified as such. One does not pay a subject: doing so radically changes the nature of information gathering and destroys the ability to capture a semblance of reality. 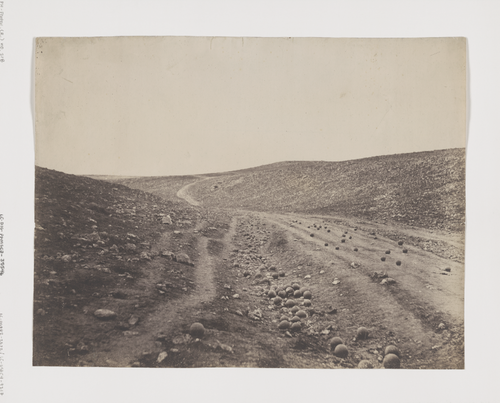 Taken during the Crimean War in 1855, Roger Fenton’s photograph of cannonballs scattered across a Crimean battlefield is one of the earliest and most famous images of war. 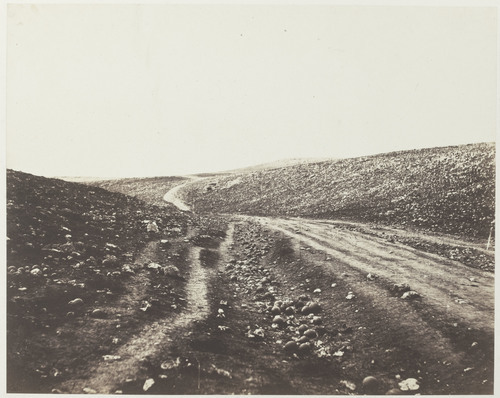 The photo is titled, “Valley of Shadow of Death.” Fenton took two photographs of the valley from the same vantage point, on the same day. In the best-known photo, cannonballs are strewn across the road; in the other photo, the cannonballs are accumulated in a ditch on the left side of the road. Learn more. POST-PRODUCTION: Post-processing adjustments, whether in the darkroom or in Photoshop, are generally used only to accurately represent the reality of the scene; for instance, to brighten a sky or darken a scene taken at dusk. Objects must never be added or removed from the image in post-production. Adnan Hajj, a Lebanese freelance photographer working for Reuters, used Photoshop to clone and darken the smoke to exaggerate bombing damage by Israeli warplanes. 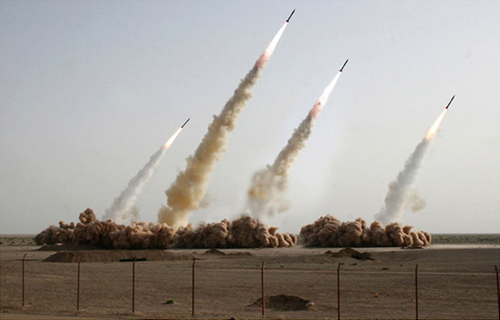 This photo was distributed to news outlets around the world before the manipulation was discovered by Little Green Footballs, an American political blog. Learn more. CAPTIONS: The context in which a photo is shown--the information published with it—is often as important as the image, sometimes more so. Does it matter that Robert Capa’s iconic photo from the Spanish Civil War was not taken when and where the caption stated? For history, it matters very much. 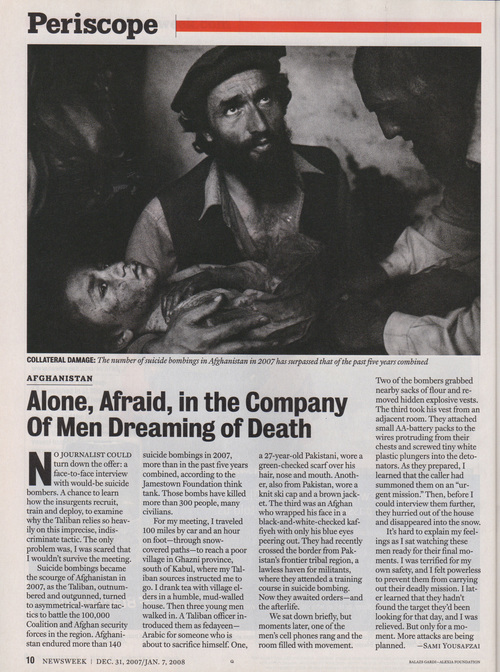 Newsweek published this photo by Balazs Gardi in their December 2007 issue with the caption: “The number of suicide bombings in Afghanistan in 2007 has surpassed that of the last five years combined.” The accompanying story and headline referred to Taliban suicide bombers, enemies of the Americans. The child was actually wounded by an American airstrike, not a Taliban suicide attack. Learn more. Following WWII, a code of photographic ethics emerged. Experienced photo editors, alert to signs of manipulation, pored over negatives and contact sheets. Today, bankrupt and cost cutting media publications have laid off photo editors and staff photographers by the thousands. Many untrained and poorly paid freelancers--each with the power to alter a scene at the click of a mouse--have largely replaced them. Editors with little or no photo experience post images to the web in seconds. Corporations, political campaigns, and regimes around the world flood the Internet with doctored photos. 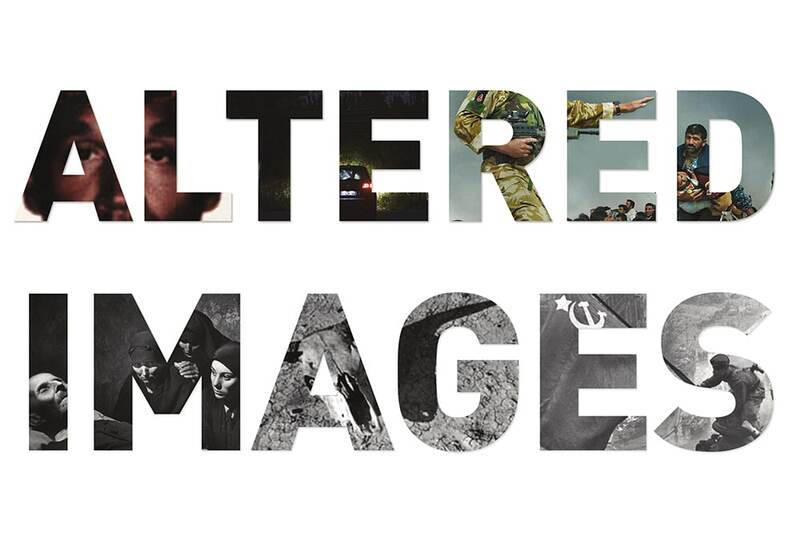 A new barrage of altered images is being presented to the public and we are faced with a crisis of credibility. Altered Images is made possible, in part, by the Phillip and Edith Leonian Foundation, the Ford Foundation, the New York State Council on the Arts with the support of Governor Andrew Cuomo and the New York State Legislature, by public funds from the New York City Department of Cultural Affairs in partnership with the city council and by City Council member Maria del Carmen Arroyo. We gratefully acknowledge the assistance from Associated Press, European Press Agency, The New York Times, The Washington Post, the South Dakota State Historical Society, Art Resource, International Center of Photography, Getty Images, and the San Antonio Public Library.